Apple iPhone or HTC Hero Sense UI? 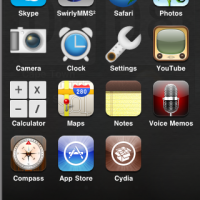 My new iPhone theme – looks just like the HTC Hero Sense UI – except that it’s an Apple iPhone! We know that HTC Magic owners out there are pretty psyched at the news that the HTC Sense UI is available for their Android phone. However, based on this latest news, it appears that iPhone owners also have a reason to rejoice as they too can enjoy the benefits of this new user-interface! Well, it looks kinda nice, but there is no real new functionality! 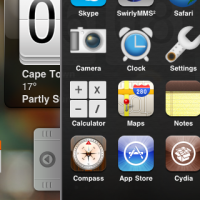 Hi, i am looking just for the sliding tray that hides and shows the icons off the application. is it part of the Theme or widget ?